Newborns’ breathing is not exactly similar to that of the adults. You could say it’s a little erratic, it could be too fast or too slow. These uneven patterns can cause lot of anxiety to a new parent, especially if you’ve read or heard about SIDS (Sudden Infant Death Syndrome). The best way to get rid of this panic and restore your peace of mind is to get a baby movement monitor which tracks baby’s breathing. 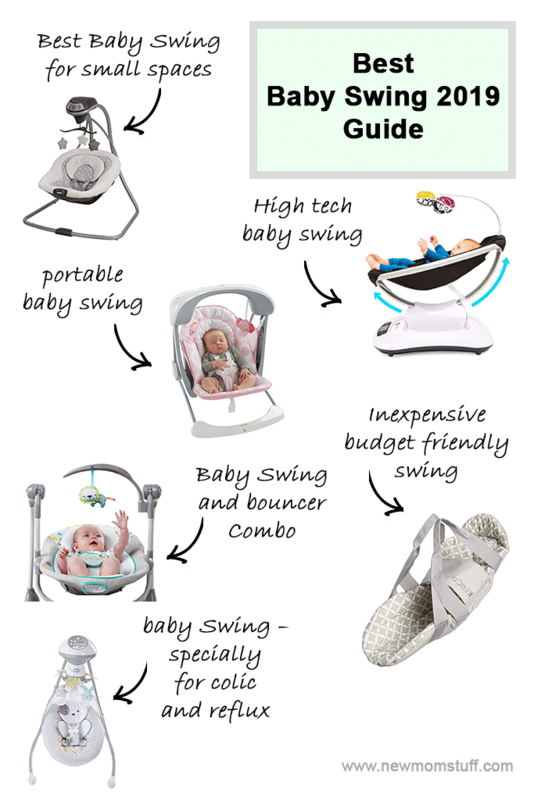 This guide is to help you find the best baby movement monitor based on your situation and budget. Lets check them one by one. 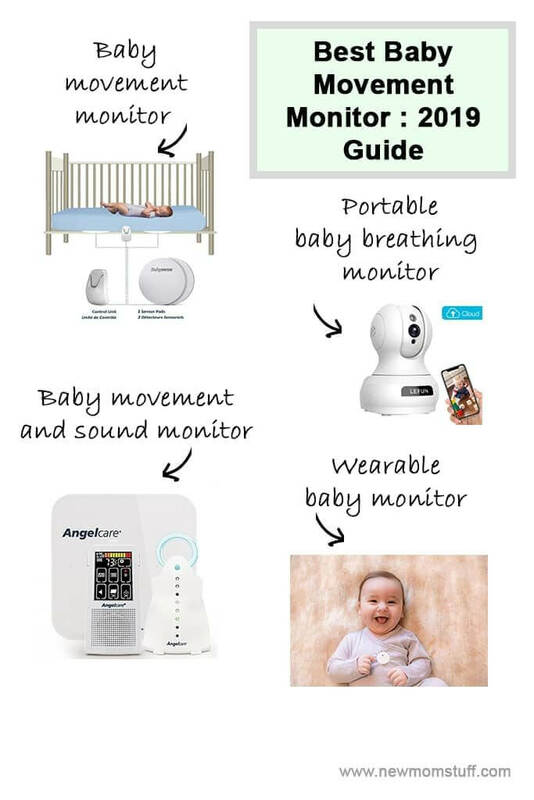 What to look for before buying baby movement monitor? Ease of use. 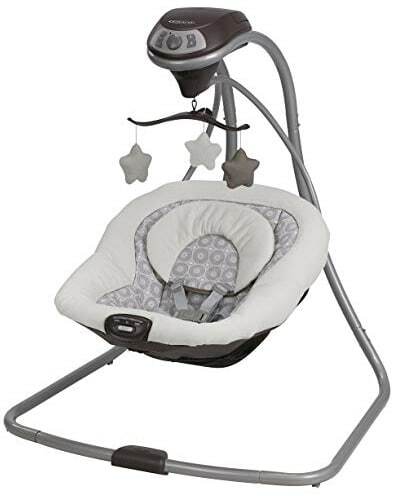 Go for a baby movement monitor that delivers a balance between functionality and ease of use. Choose a product that requires no assembly or no complicated connection system. Both sensory and wearable movement monitors for babies come with advantages and disadvantages, but the best choice is one that doesn’t make your mind churn on setting up alarm, audio o visuals, and so on. Alarm. 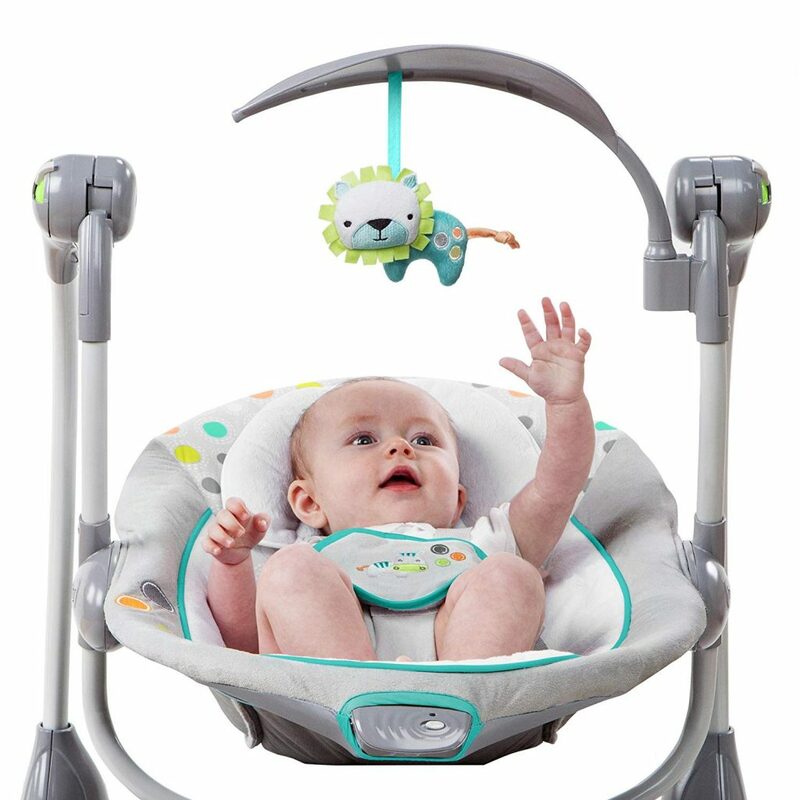 Choose a baby movement monitor that easily captures your attention. Alarm functions need not only emit shrill or annoying sound to get your attention, it must also include flashing lights for visuals. Go for an alarm system that can be manually set according to your requirements. Sensitivity. Both sensory and wearable baby movement monitor must have an adjustable sensitivity label. It cannot be helped that some babies may exhibit lighter or be stiller than others thus requiring sensitivity settings at a lower level. You wouldn’t want a parent unit to sound off its alarm every time or to give you a fright for not sounding off at all. EMF -electro magnetic field. EMF radiation is known to pose negative impact to brain development and immune system. In fact, some baby movement monitor can disrupt normal sleep-cycle causing unfavorable health conditions to babies. So always choose one that features lower EMF and make sure to limit baby’s exposure to these devices to ensure healthy growth. 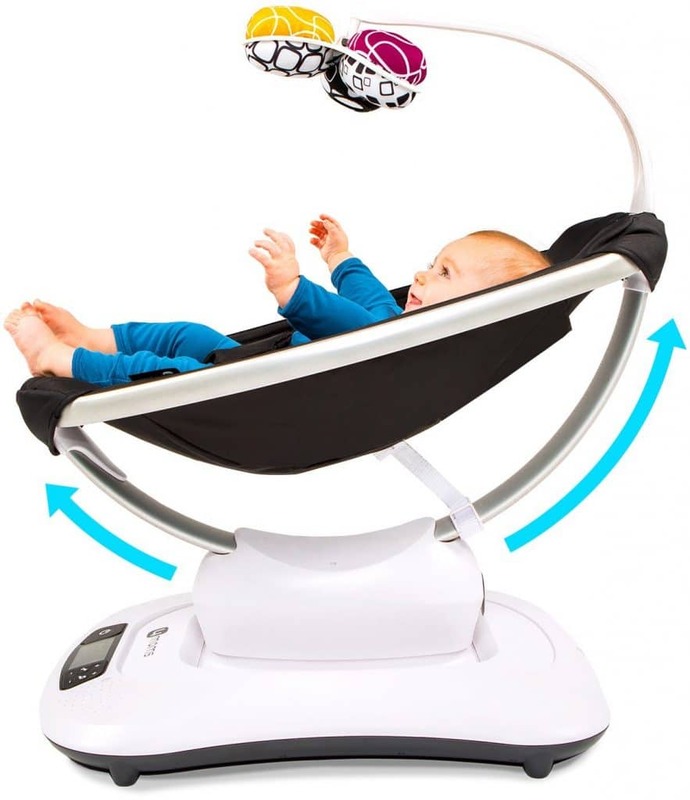 Sensory: This type of baby movement monitor uses vibration technology to keep track of a baby’s movement. It sends signal to an input monitor usually snapped into a crib or via a monitor placed within allowable range. 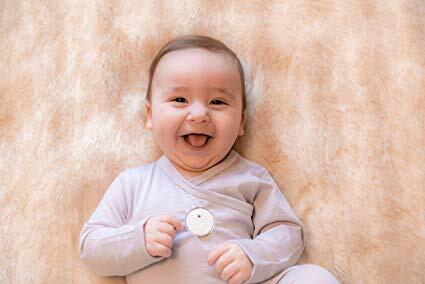 Wearable: As the name implies, this type of baby movement monitor is worn by baby. It is utilized by attaching to a baby’s clothing or via a diaper’s band. Hypersensitive and more accurate, it does pose more risk of EMF exposure due to close proximity of the device to baby’s body. From the forerunner of under-the-mattress baby movement monitor, the new and improved BabySense 7 offers astounding safety features for baby giving parents more peace of mind. From its original creation of non contact infant monitor, the brand offers more enhanced sensitivity feature with lower risk of false alarms. 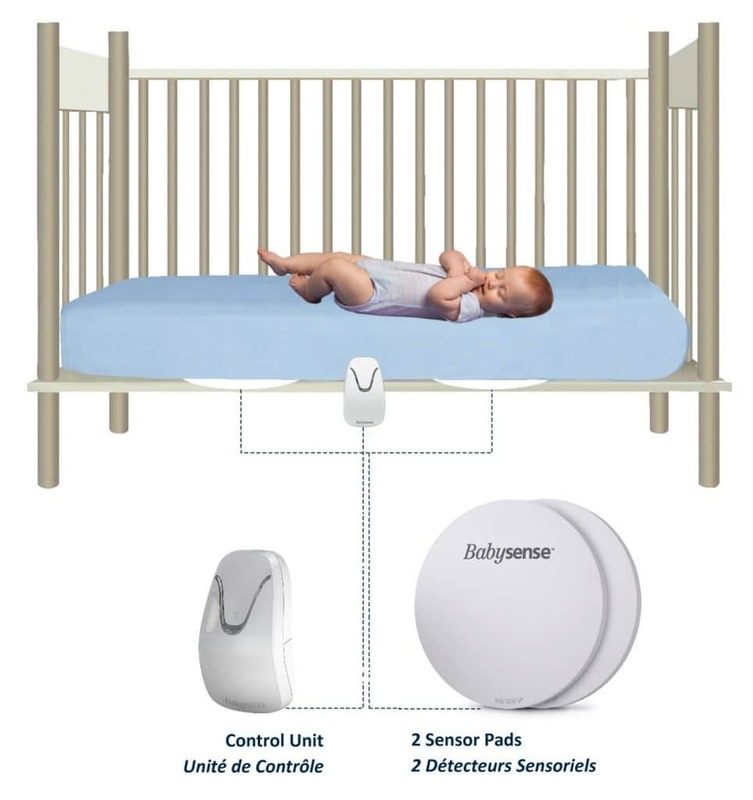 The Babysense 7 – Under-The-Mattress Baby Movement Monitor’s passive sensor system detects movement and sounds the alarm if none can be observed in 20 seconds or if movement rate goes lower than 10 micro-movements per minute. 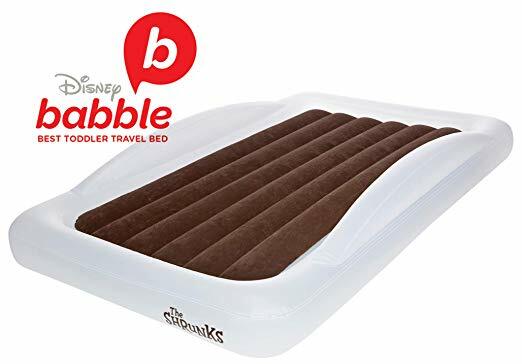 It works via its 2 sensitive sensor pad usually placed underneath a baby’s mattress. Both auditory and visual alarms activate when slow or irregular movement is noted. One of the most trusted medical devices recommended by the Ministry of Health across the globe, it continues to help monitor millions of babies preventing cases like SIDS. Some people reported if fan is on anything higher than the lowest setting the alarm wouldn’t trigger because it caused too much interference. 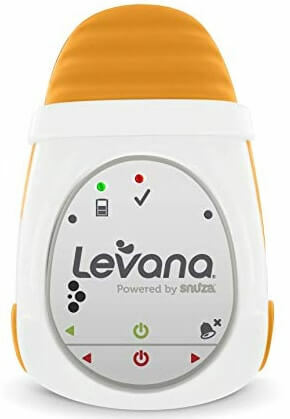 If it’s a wearable baby movement monitor you want, the Levana Oma Snuza Baby Movement Monitor offers utmost portability and convenience without sacrificing safety for baby. Using no wires or cords, it can be clipped on baby’s nappy area allowing closer monitoring of movement for more accuracy and less false alarms. It can also be set to monitor weak or infrequent movement which is particularly useful for pre-term infants and infants with known health condition. Can be clipped to baby’s diaper so it can move with the baby when moved from co-sleeper to the crib. Want a baby movement monitor that works like a smartphone or tablet? 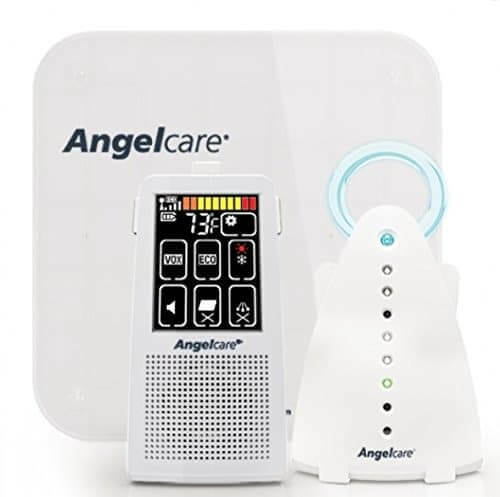 The Angelcare AC701 Touchscreen Movement and Sound Monitor is a sensory type monitor with the pad placed underneath a baby’s mattress connects direct to a nursery unit via digital transmission with frequency hopping technology that prevents interference for more accuracy. Parent unit offers not just touchscreen capabilities but also two-way audio allowing Mom or Dad to communicate with baby. The sensitivity of the sensor pad can also be adjusted as well as is nightlight. Other features include location feature, soothing sounds, audio Tic monitoring, lights, out of range indicator, low battery alert, temperature, and so on. The nursery unit doesn’t use rechargeable batteries, but gives warning if the batteries are getting low. Another excellent wearable baby movement monitor comes perfectly designed for babies learning to rollover and crawl. The MonBaby Breathing Movement, Rollover & Activity Monitor is designed with accuracy and safety in mind. 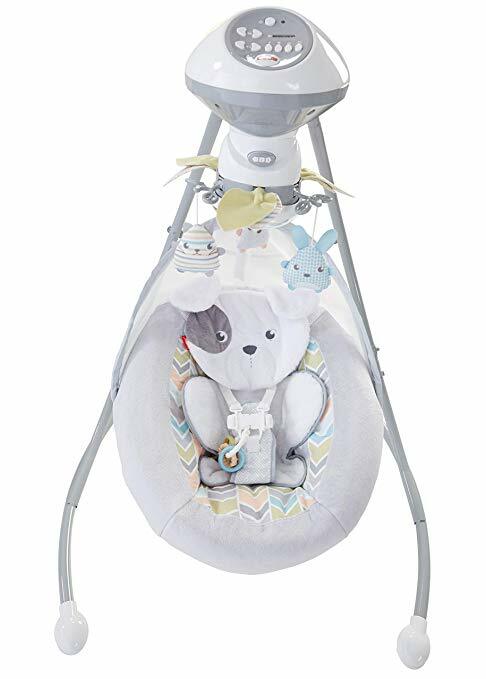 Offering quick and easy snap-on feature, it can be easily attached to baby’s clothing without worrying of falling or causing discomfort to baby. It monitors breathing movement, position of the body, and fall detection with utmost proximity for more accuracy and reduced false alarms. Instead of monitoring via an LCD screen, simply download an app to your smartphone and voila! Keeping track of your baby’s whereabouts can be done with ease anytime, anywhere. Baby movement monitor is not a medical device on which you can solely rely to prevent SIDS . However, they can surely provide some peace of mind for new parents, and get some much needed rest. 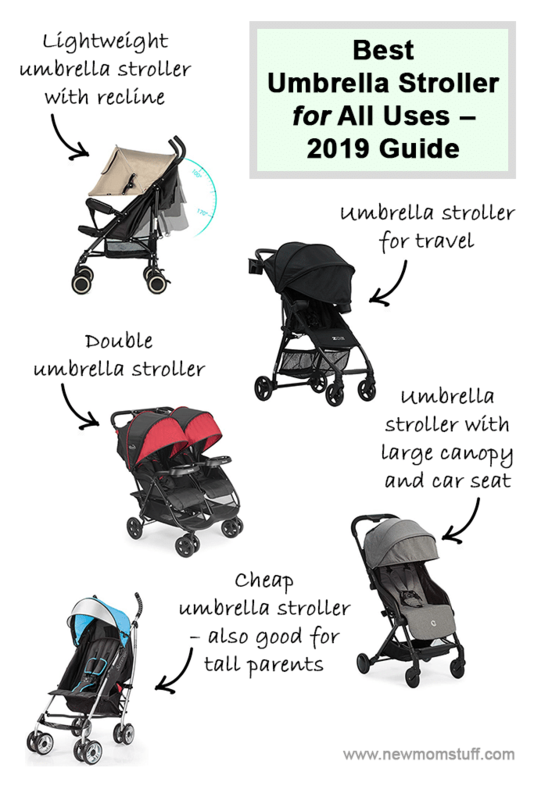 Buying a double stroller can be daunting as you have to consider several factors like – would it be a side by side double stroller or a tandem double stroller?. Will it be fit for two child of different age or good for twins only? You will also need to consider the size and width also to move it through doorway or folded and carried in trunk for transport. 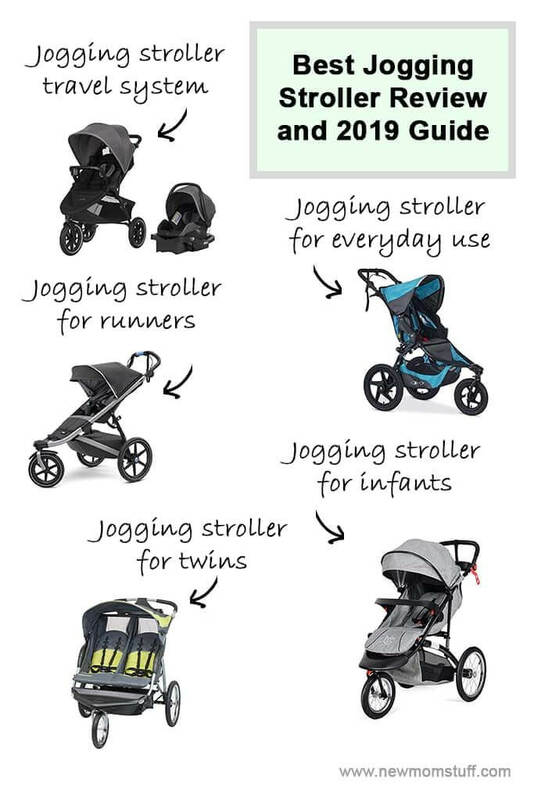 And of course you have to consider the safety and comfort factors of the strollers to. 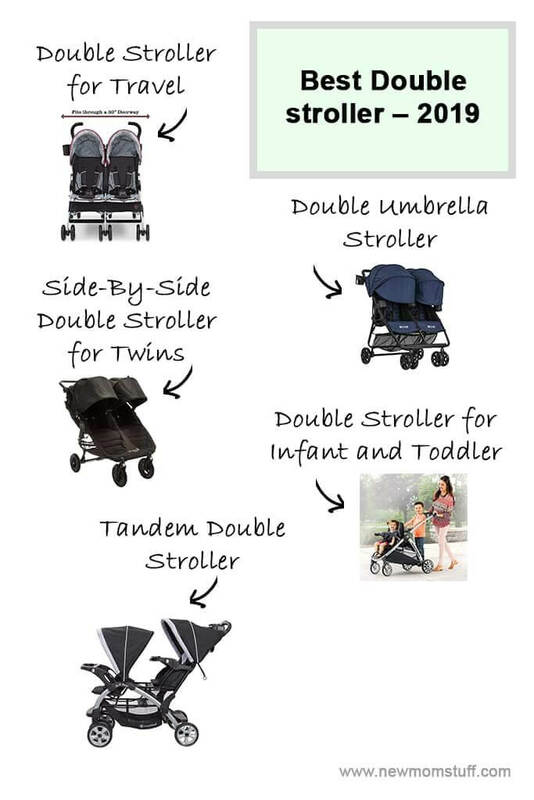 To make it easier for you, after hundreds of hours of research we have narrowed down to the following 5 double strollers suitable for different usage. Going on a much needed getaway with kids in tow? 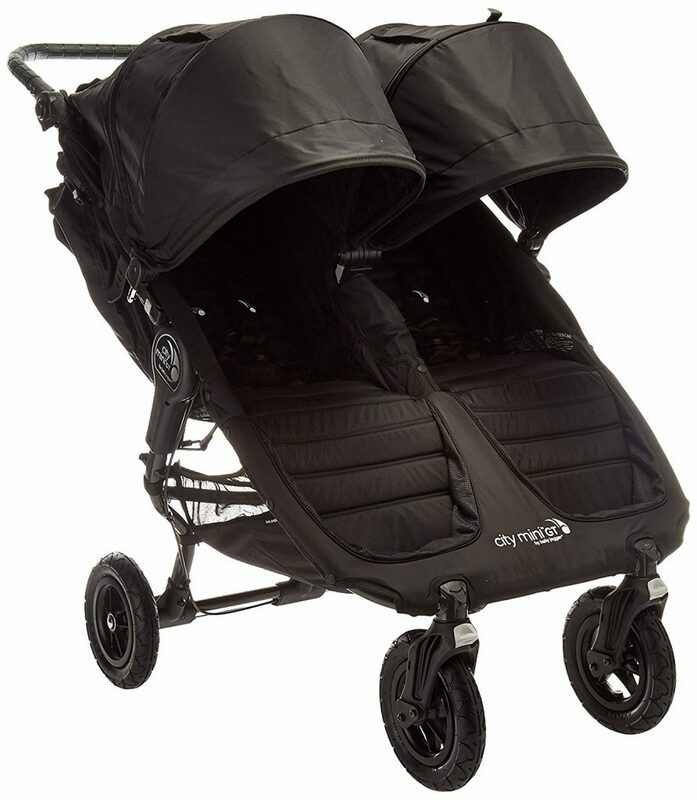 You don’t have to look haggard hauling them around with the Jeep Scout Double Stroller. 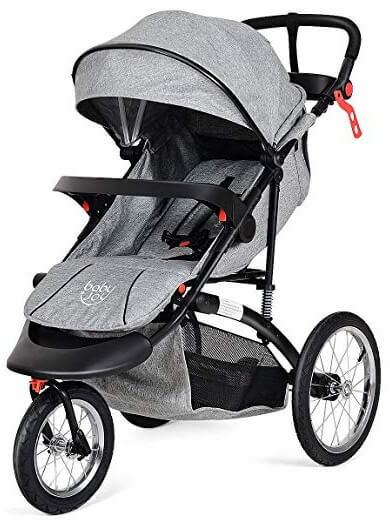 Designed to be lightweight and can fit to standard 30-inch wide doors, this travel savvy companion stroller can accommodate 2 kids in tow without any hitch. 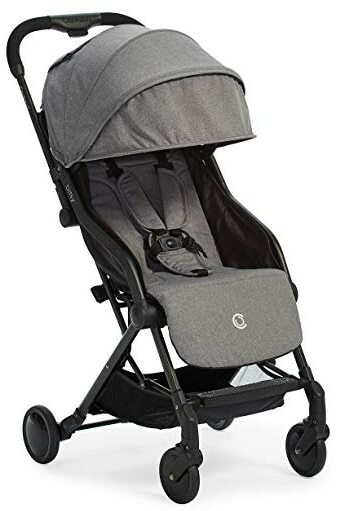 It features ultra-safe 5 point safety harness with comfy shoulder pads and high-viz material, 5.5-inch wheels with front swivel and suspension system, and extendable European-style canopies with sun visor to guarantee ultimate safety and comfort for your children when out and about like say in Anaheim’s Disneyland or roaming the cobblestone streets of Prague. Add to that double storage system and parent cup holder so you won’t go thirsty hauling two kids around. Having twins is quite a challenge particularly when going out. 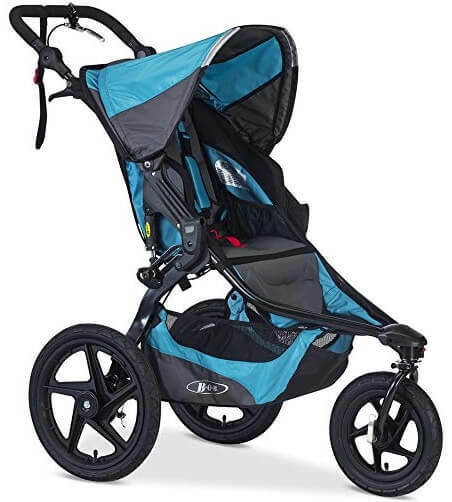 Fortunately, the Baby Jogger 2016 City Mini GT Double Stroller is here. 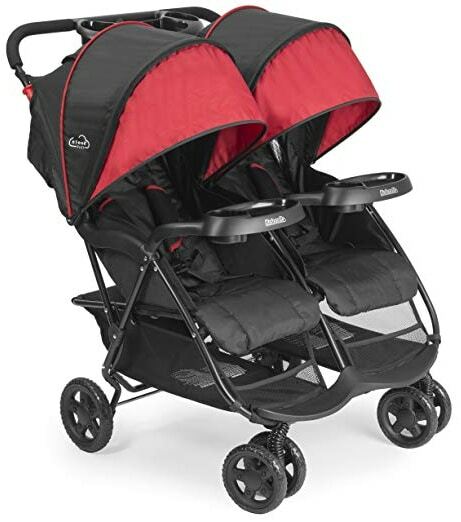 Designed for twins or families handling 2 kids when going out, this lightweight and durable double stroller come oozing with features like patented quick-fold system, padded seat, almost-flat recline position and vented seat top. 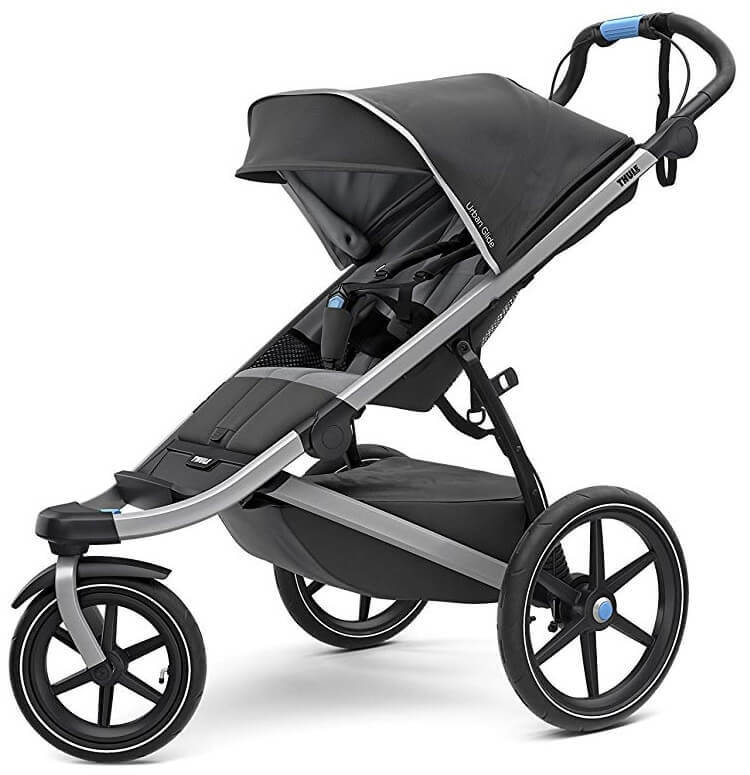 It’s large 8.5-inch all-terrain non-flat tires with front-wheel suspension system makes maneuvering easy and without any fuss while maintaining comfort for babies when on a ride out. 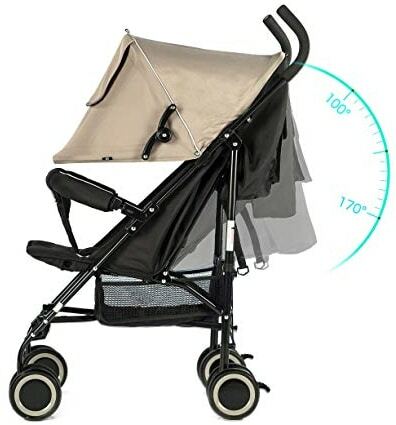 Checking your little ones while strolling along is also convenient with the large adjustable sun canopy’s peekaboo windows. Even the handlebar is adjustable to suit parents of all heights. Basket on the underside can be accessed only from the back. Does not have accessory fittings like a cup/ bottle holder. 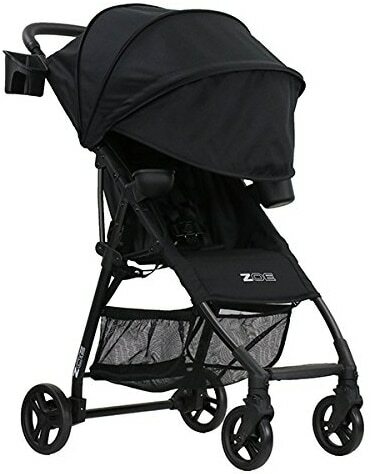 Yet another awesome double umbrella stroller is the ZOE XL2 BEST v2 Double Stroller. Made of lightweight yet durable aluminum frame, the handle and kickspace offers ultimate control for user to maneuver the stroller. Though lightweight at 17lbs, it can carry at most 100lbs complete with full-throttle self-locking mechanism to guarantee safety. 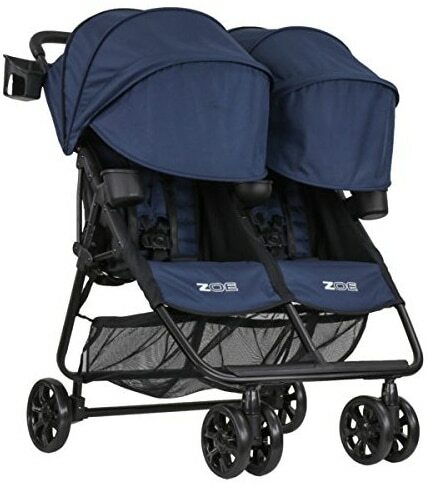 The double stroller also offers 3 recline position– 165-deg, almost-flat recline at 180-deg and 90-deg for seating position– and large wheels with swivel mechanism. 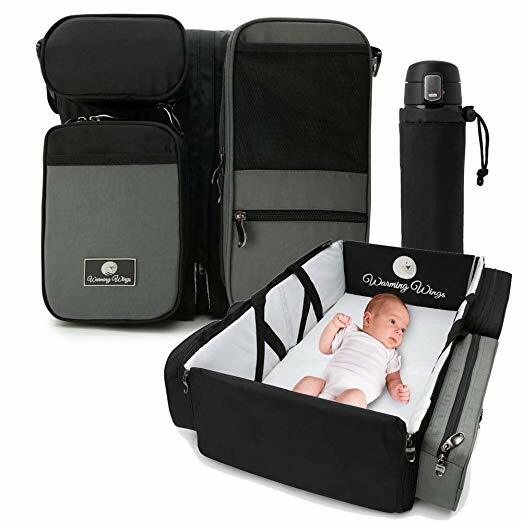 It also features a double belly bar, padded harness with removable strap cover, 4-panel removable canopies, cup holders and snack cup for both parent and child, and storage basket to stash other necessities you and your babies needs when out. Choose from Aqua, Black, London Navy or other cool colors here. Bringing a baby with another child toddling along can post complications to any parent. 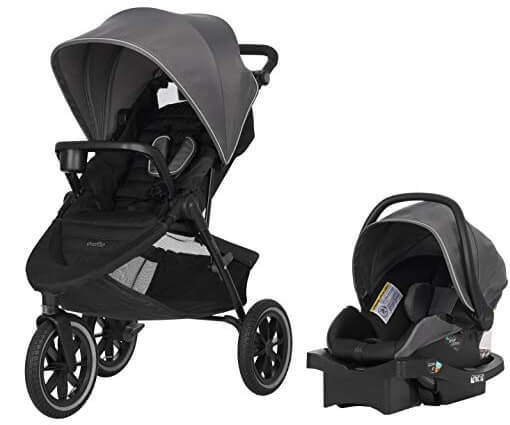 With the Chicco BravoFor2 Standing/Sitting Double Stroller, this woe is finally resolved! Designed to accommodate both an infant and a toddler, this double stroller is equipped with an adjustable infant stroller seat which can be fitted into a car seat and a two-way toddler backseat/standing platform to guarantee comfort for both children. Without sacrificing safety, infant stroller seat comes with a padded 5-point harness while the toddler backseat also comes with a 3-point harness. Easy-grip handles, large wheels with swivel and suspension system, and one-touch brake system guarantees ease of maneuvering to ensure smooth ride for both children. For added benefit, the stroller comes with 2-cup parent tray and storage compartment to hold necessities. Folding the BravoFor2 is also easy and can fit easily to the trunk of one’s car when not in use. Check it out here. Bottom storage area and cloth zipper pouch provides enough space to carry tissues, diaper bag etc. 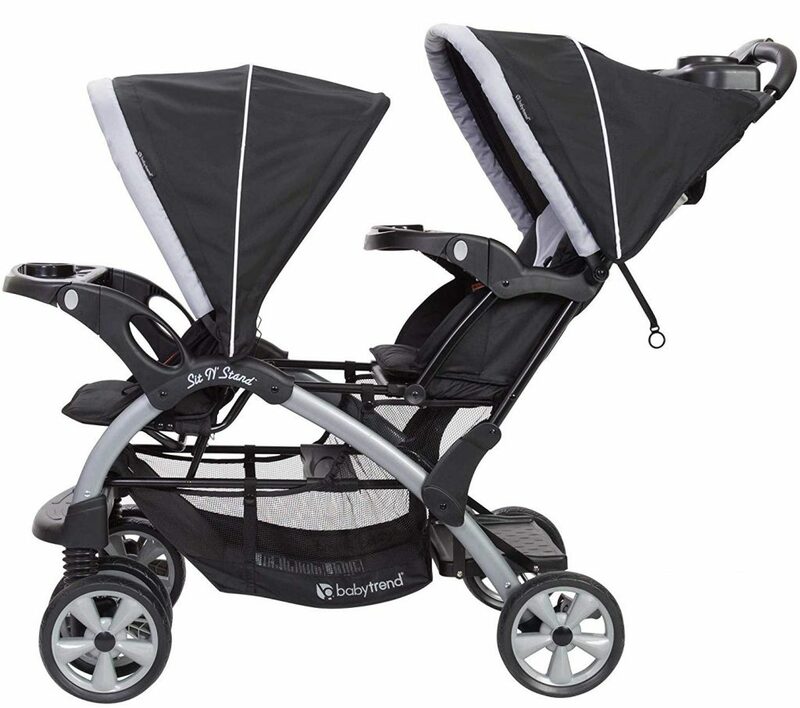 Another excellent choice for households with twins or two children i—infant and toddler – is the Baby Trend Sit N Stand Tandem Stroller. 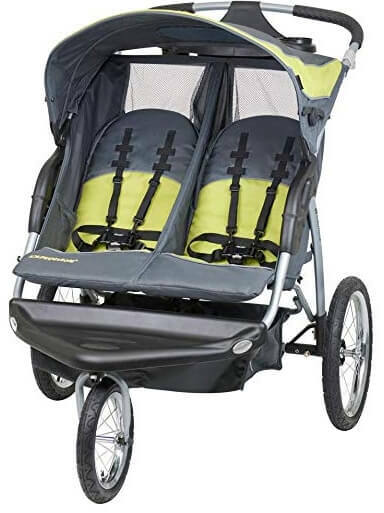 It’s a convertible tandem double stroller having a removable rear seat for a standing platform. 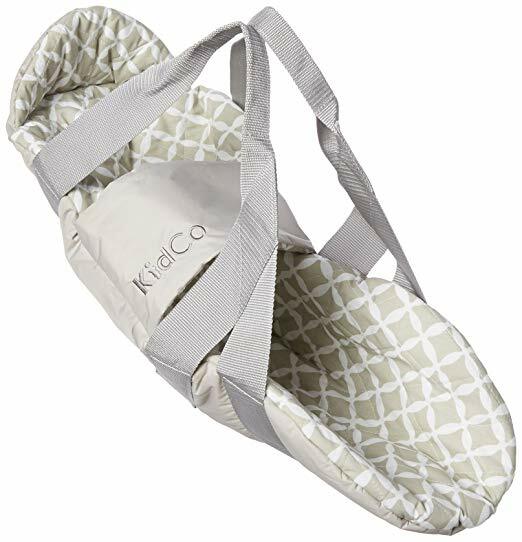 Fits most infant car seats, it can accommodate such in either front or rear seating position while older child can also sit in either front or rear seat, or simply stand on the platform of the rear area. 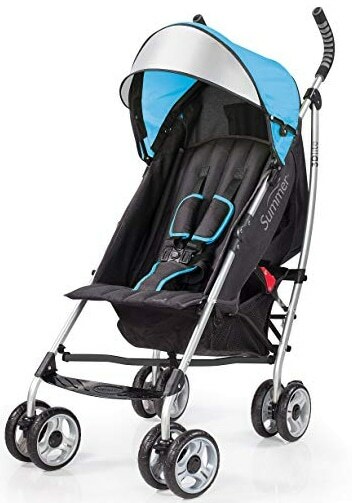 Even with such arrangement, the stroller is relatively lightweight and compact equipped with large wheels with swivel mechanism and foot-activated dual-rear parking brake and wheel-locking system. 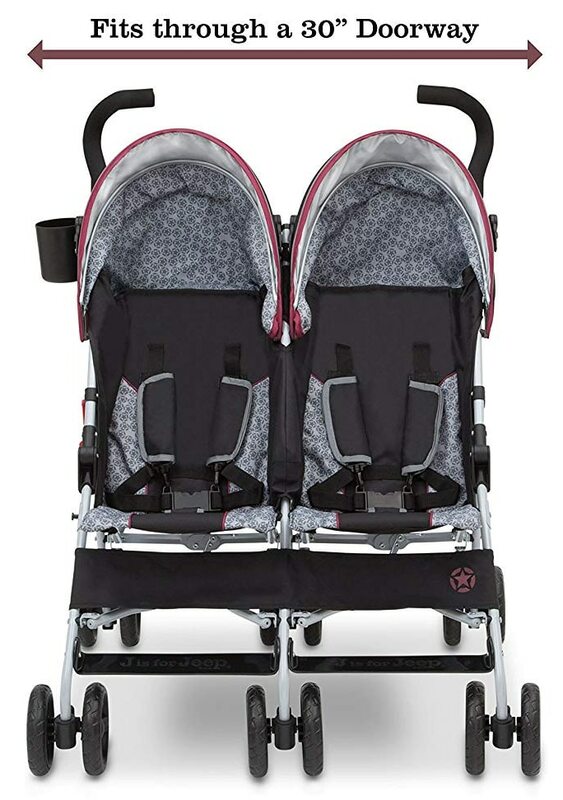 Add to that the padded 5-point harness for baby’s seat and you got the ultimate tandem double stroller designed with safety and comfort in mind. Added features include 2-cup parent tray and large storage basket to hold necessities. Seats could have been a little bigger to accommodate taller toddlers. Hope this guide has given you a good view on what’s available on which are the best to choose depending on your situation . If you are still undecided, post your question in comment below. While a baby monitor’s benefits cannot be contested, the number of brands offering the “best” products in the market can be overwhelming. After hours of research expressed by new moms and my personal experience, I have handpicked five of the most widely used dual baby monitors that comes highly recommended than the rest. Here’s the best baby monitor for 2019. With remote pan, tilt and digital zoom you get total vision control of your baby’s entire room, or any room for that matter. Check out what other Mom’s have to say about this baby monitor. What to look for before buying a dual baby monitor? 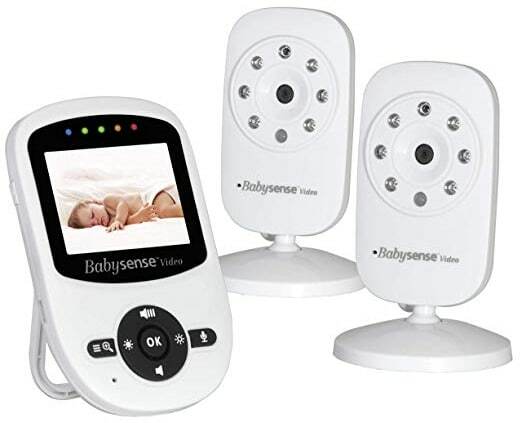 You would want a baby video monitor that can scan multiple rooms with DECT technology and night vision that helps to cancel unnecessary noise but just your baby’s coos and cries wafting from the room. Rechargeable batteries also cut cost on buying battery packs all the time as you’ll be most likely using the monitor 24/7. For a more tech-savvy approach, a monitor that can be tracked via your own Smartphone or tablet wherever, whenever can help give the peace of mind you need. With interchangeable optical lens capability it allows you to customize the viewing performance by switching different lenses on the camera in just seconds. You are free to choose the best focal length and viewing angle for your baby, just like a professional camera system. 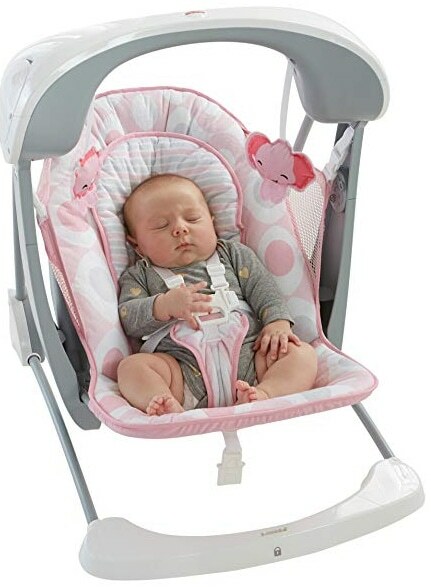 It has many more great features for example temperature reading so we know our little one is nice and comfortable. Each box of the Infant Optics DXR-8 Portable Video Baby Monitor comes with a normal lens that captures vividly clear moving images within mid-range coverage. 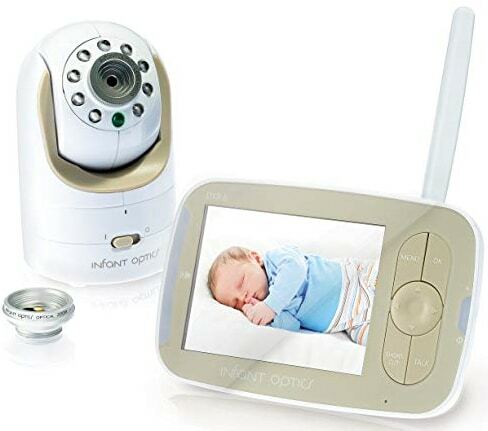 Additionally, an optical zoom lens is also provided to give you perfectly close-up view of your baby as he or she sleeps. When your baby grows and you want 170-deg panoramic view, get a wide angle lens which can also be bought to best guard an active baby or toddler as well as those with special needs. The pan and tilt works very well and the camera is very responsive to the remote display input. Both zoom and camera angle can be controlled remotely via the monitor. Want to monitor multiple rooms or children in different rooms? All you need to do is buy this add-on camera unit. You can add up to 3 of this add-on camera to fully secure all rooms in the house. 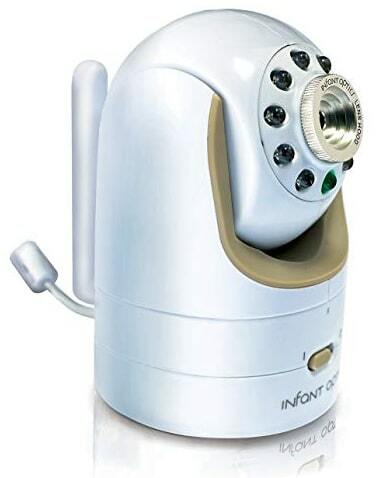 This baby monitor comes with Two Cameras allowing you to monitor twin babies or monitor two children in two separate rooms from one Parent unit. You can move around with the portable parent unit as you complete your daily chores enabling you to hear, see or talk to your baby no matter where you are in the house. It gets fully charged in 1-2 hours and last around 8 hours of continuous use. Gets fully charged in 1-2 hours and lasts for 8 hours continuous use. When the monitor is on Eco mode, the sound is still on unless manually muted. 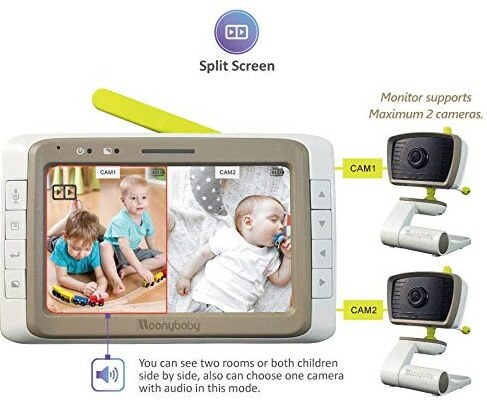 If you want something more affordable, check this..
MoonyBaby Split Screen Video Baby Monitor is an excellent option to keenly observe two rooms in the house. It features long-range coverage of up to 1000 feet, integrated wide-angle lens and zoom-in function with voice activation and scan mode function to get a closer look of your precious ones at the same time. At night, the night vision feature of the Moonybaby monitor can be clearly seen and it’s audio clearly heard. Aside from these high levels of safety features, it also comes with built-in room temperature monitoring and lullabies. Great option of keeping watch on twins simultaneously, Just put one camera on each crib. At this price, no other brand supports dual camera and excellent split screen functionality. The 2 way talk feature is not that great. The Lollipop Baby Camera is tagged a “smart” baby video monitor– and for good reasons. Sleek, creative, stylish and tech-savvy, this Wi-Fi enabled monitor features astounding characters to put any parents’ heart at ease at night or when out leaving the children with a sitter. It comes with multiple screen option, audio mode and alarm system, “true crying” detection, and real-time streaming. It can even be viewed using multiple gadgets at the same time and with audio mode, you can turn screen of your smartphone off and still listen to what’s happening in the nursery. Add built-in lullabies and relaxing sounds to the loop and you have one astounding baby video monitor. The Lollipop can be used for indoor or outdoor monitoring in multi-streaming platform for more coverage. You can place it on top of the table or looped on the crib or perhaps, high up on the wall. When using cloud, privacy mode can also be activated to protect your home and family. Check more color options here. Watch multiple camera at same time which streams on your phone. Night vision is not that great. 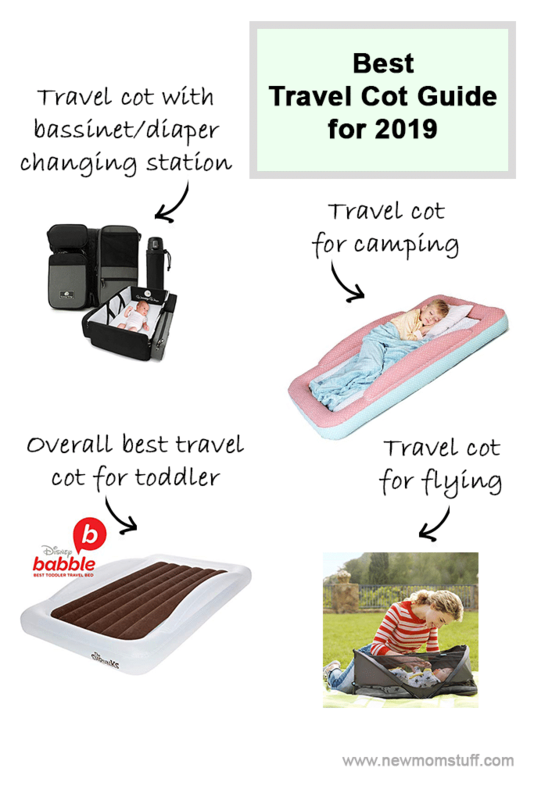 Want to coo your baby even when outside or in the other room? That can be made possible with the VTech VM321-2 Safe & Sound Video Baby Monitor. 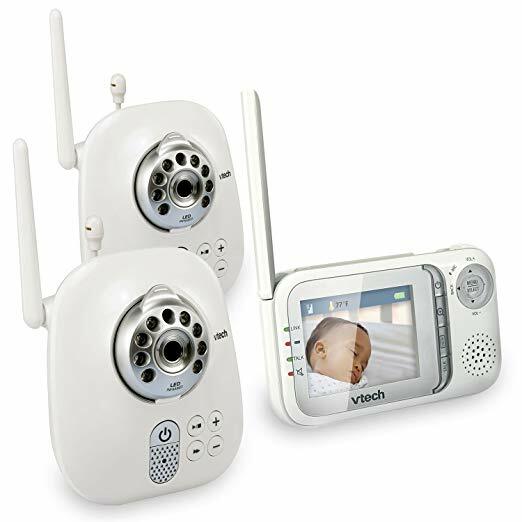 Designed with your baby’s safety and comfort in mind, this baby video monitor features “talk-back” functionality that allows you to comfort your child on a 2-way talk-back intercom. The package comes with a parent monitor and 2 camera units with adjustable high-res 2.8-inch colored LCD screen. It digitally transmits both audio and video signals of up to 1000 feet via its 2.4GHz system and comes with a Dect 6.0 digital tech that guarantees clear transmission all the time. Alarm can be set on parent monitor to address concerns like low battery or temperature drops and infrared LED allows for clear night-time observation. Want it preset in French? Oui, that can be made possible as it can be switched to that or even in Spanish. If mounted up high on the wall it can get almost the whole room in the camera which is important with bigger kids capable of roaming around in the room. Bright clear picture with zoom in facility. Music cannot be controlled by the parental unit and you have to go to the nursery to push the button on the video monitor. 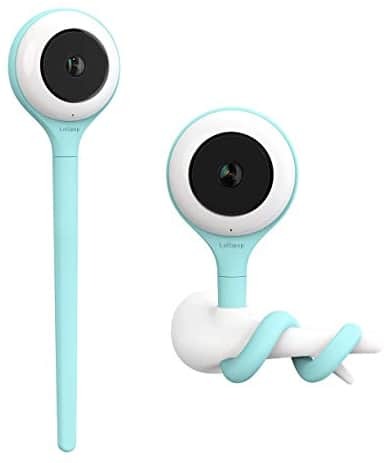 The top pick is of course the Infant Optics DXR-8 Video Baby Monitor with full capability of tilt , zoom and wide angle lens panoramic . Check out both from here together and see if any discount is available currently. If budget is really a constraint then I would go for the 2nd best option Babysense Video Baby Monitor with Two Digital Cameras for the twins. It costs considerably lesser but provides almost same level of security and convenience to parents who are cash-strapped. Picking the right one, however, is all about personal preference and, of course, your budget. Hope you now have a better idea which one will suit you best!